The bride of the Red Sea as well as Saudi Arabia’s commercial capital, Jeddah is one of the liveliest cities in the country. It is the main commercial bay in the kingdom and the main international airport for pilgrimage. Pilgrims have been stopping in Jeddah over the years to enjoy a relaxing couple of days in the charming city and enjoy its plentiful shopping and dining options. For these reasons and more, restaurants in Jeddah are various and cater to all tastes. 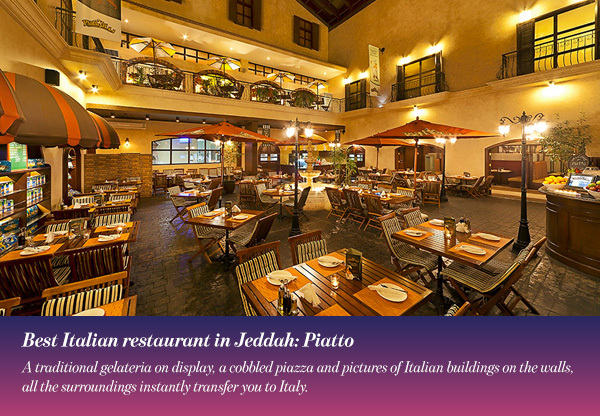 The dining scene in Jeddah is one of its major tourist attractions. The beautiful city is renowned for its diverse food scene and of course, as a coastal city, one of the stars in this scene is seafood. Mixing different cuisines, restaurants in Jeddah have something for everyone. Dining out in Jeddah is a marvelous must have experience for food lovers. So, if you are looking for the best place to dine out in the bride of the Red Sea, these are the best restaurants in Jeddah. This extravagantly designed restaurant with its red and gold marquee gives you a chance to dine like royalty. Located inside the lower lobby of the Hilton hotel, this truly is a five star restaurant. While the ambiance sets the perfect atmosphere for a night out in Jeddah, the delicious food certainly makes the experience really worth it. From the Iranian breads made in an open Persian clay oven right in front of you, to the mouthwatering lamb kebabs this restaurant provides a true Persian experience. The elegant romantic décor, with the gold chandelier and the red upholstery, makes Al Khayam a very popular choice with couples. There is a wide selection of offerings in the menu, including a selection of exquisite caviars, but the kubideh, which is an Iranian minced beef and lamb kebab, is a must try! It is one of the best in the city. Piatto, which is Italian for dish, serves marvelous authentic Italian dishes! The restaurant is even decorated to simulate an Italian village. A traditional gelateria on display, a cobbled piazza and pictures of Italian buildings on the walls, all the surroundings instantly transfer you to Italy. Bring a hearty appetite, and be careful not to get full on the complementary salad and bread basket no matter how mouthwatering they are. Leave room for the pizza as it is one of the best you will have! Piatto prides itself on using only the freshest ingredients in all their food, and it definitely shows! The pizza crust is heavenly as are the fresh toppings. The homemade pasta is just as delicious as well. The menu includes some toothsome Italian dishes besides the pizza and pasta, you can choose anything and you will be very happy. Pro tip though, you can never go wrong with anything that includes their signature to-die-for gorgonzola sauce. And do not forget to try the gelato; it is soft, creamy and simply marvelous. Besides, it would not be a true Italian experience without it. Superb authentic Asian experience, Toki serves a wide variety of traditional Chinese, Malaysian and Thai cuisines to provide a unique blend of exotic Asian flavors. Native Chinese specialty chefs keep the flavors and the cooking methods authentic. 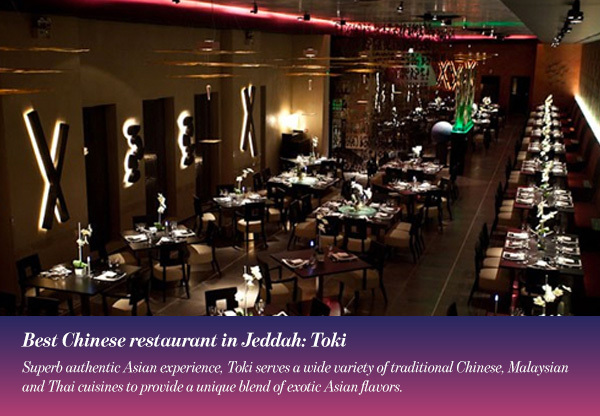 That is probably why Toki is one of the most popular Chinese restaurants in Jeddah. The beauty of the food is only rivaled by the beauty of the décor, ornamental pillars, gorgeous chandeliers and dressed ceilings make for an elegant place to enjoy the evening while feasting on Asian delicacies. For a lively group dinner, the large circular glass-topped tables have spinning centerpieces. This makes sharing dishes a fun experience. Do not forget to try the crispy Peking duck, crisp and juicy and perfect through and through. 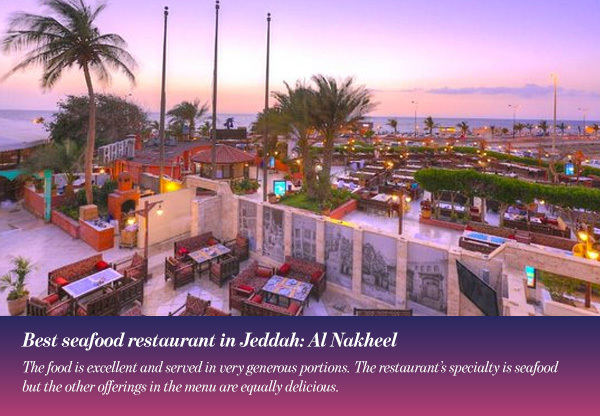 Popular among tourists and locals alike, Al Nakheel offers a beautiful taste of Jeddah. Located near Jeddah’s charming Corniche, this is one of the most popular outdoor restaurants in Jeddah. The restaurant is styled like a traditional tent letting the balmy sea breeze in and allowing for the calming sound of the waves to complement the Arabic background music. The food is excellent and served in very generous portions. The restaurant’s specialty is seafood but the other offerings in the menu are equally delicious. For a taste of the Red Sea, try the locally caught Najel, local name for Red Sea grouper, and the grilled shrimp. 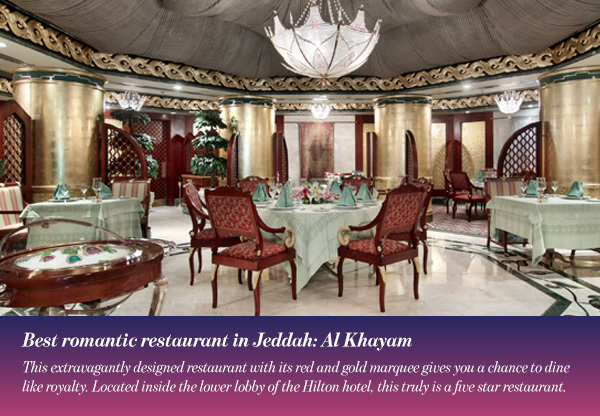 Quality, style and authenticity, this place is one of the most luxurious restaurants in Jeddah. 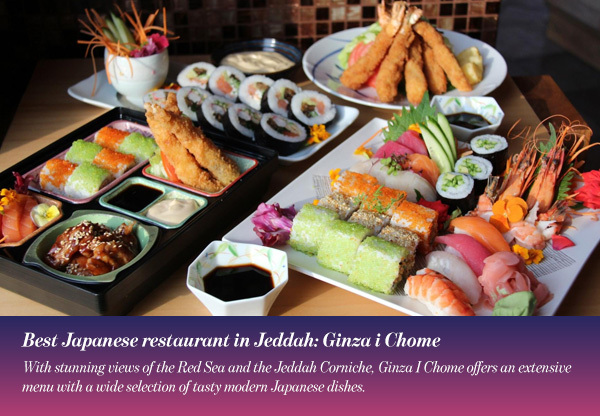 With stunning views of the Red Sea and the Jeddah Corniche, Ginza I Chome offers an extensive menu with a wide selection of tasty modern Japanese dishes. The restaurant is set on the 2nd floor of the Rosewood hotel, and it is popular for the food, the view and the live cooking. The main feature in this restaurant, and its top attraction, is the extraordinary hand-carved stone bar where the experienced chefs impress the guests with their culinary magic! All you can eat buffets are often available. There is also a beautiful Japanese garden where you can sit and enjoy your food in marvelous serene setting. If you are looking for the best sushi in Jeddah, this is definitely the place for you. 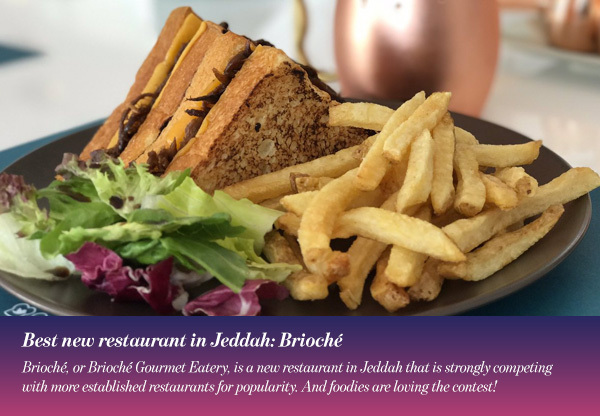 Brioché, or Brioché Gourmet Eatery, is a new restaurant in Jeddah that is strongly competing with more established restaurants for popularity. And foodies are loving the contest! Fresh high quality ingredients, unique recipes and heavenly Brioché bread make the restaurant’s signature sandwiches. Twelve-hour slow-cooked beef brisket with homemade barbecue sauce, served with fresh crunchy coleslaw, who wouldn’t love to devour that?! The décor is simply elegant, white and chrome décor make the place bright and relaxing. The food is the star here, everything else is a lovely background. Hakim Bagabas, the Saudi Chef, is the culinary wizard behind this restaurant and the mastermind behind the gourmet sandwiches concept.